 Our school is named after composer Thomas Tallis. He was a true original who made music for the kings and queens of the 16th Century, and who lived in Greenwich. Two of his most famous pieces are Spem In Allium and If Ye Love Me which are still regularly played today. In 1910, the composer Vaughan Williams created a very famous piece based on a Tallis melody entitled Fantasia on a Theme by Thomas Tallis. As well as making music that has lasted half a millennium, Tallis was also an entrepreneur and innovator. In 1575 he and 21 year old composer William Byrd were granted a patent to print and publish music. This was the first time such a patent had been granted. Having exclusive rights to print music wasn't his only creative advantage: he and Byrd were so popular with the monarchy that they were given a monopoly on making what's called polyphonic music - music that includes two or more independent melodic voices. This was the equivalent of something like The Beatles being given the one and only licence to make make pop music. Fortunately, they used this privilege to make music that is still popular today. In 2012, Spem In Allium, which was composed for Elizabeth I and which features a massive 40 singers, was back at Number One in the UK classical charts. Thomas Tallis was a pragmatic musician; this was a time when the Kings and Queens switched between Catholic and Protestant faiths, with dangerous consequences for court members caught on the wrong side. Tallis, however, avoided the religious controversy and made music for everyone. When Henry VIII broke with Catholicism in 1534 Tallis changed his style. Instead of using obvious musical flourishes, he focused instead on rhythm and the relationship between words and music. He continued his creative experiments until he died in November 1585. In short, he was a true creative. Thanks to Wikipedia and BBC Music. In honest virtuous lyff he dyd excell." Check out this BBC podcast about Tallis. ​The waves that appear in our graphic identity were created by a designer who was inspired by the shape of the sound waves generated by a recording of the words Thomas Tallis School.